New Orleans, New Orleans Museum of Art, In the Eye of the Beholder: Northern Baroque Paintings from the Collection of Henry H Weldon, 1997, exh. cat. by NT Minty, pp.60-61, no.24, illus. Baltimore, The Walters Art Gallery, An Eye for Detail, 17th-Century Dutch and Flemish Paintings from the Collection of Henry H Weldon, 20th June-5th September 1999, exh. cat. ed. NT Minty and J Spicer, p.58, no.23, illus. Willem de Heusch, like his teacher Jan Both (c.1615-1652) was part of the group of seventeenth century Dutch artists lured by the light and beauty of Italy. Both was in Italy from circa 1638 to 1641; de Heusch lived there in the 1640s before returning to his native Utrecht by 1649. The experience made a deep impression on him: he signed his works, as on this painting, GDHeusch, the G standing for the Italianate form of his name, Guglielmo. De Heusch specialized in landscapes which reminded patrons of the Italy they had visited, or dreamed of visiting. 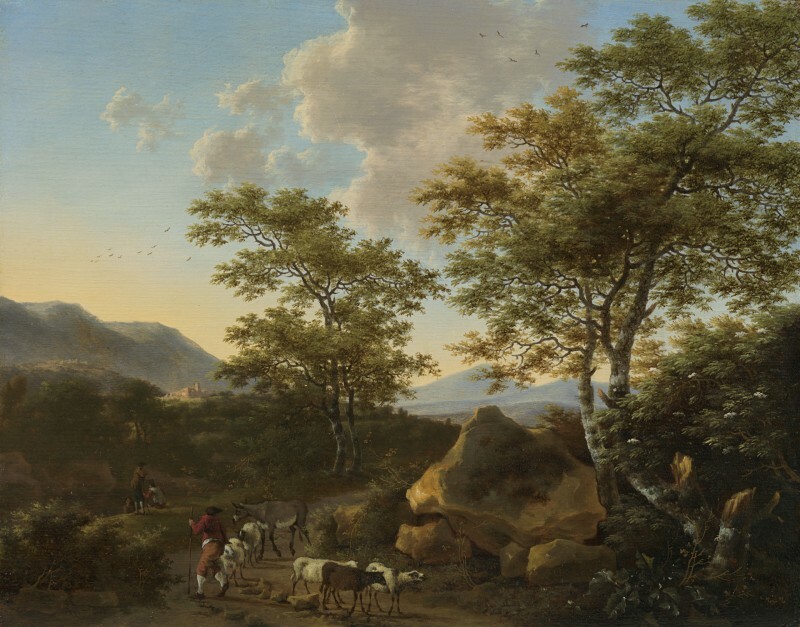 This painting evokes the Campagna, the hilly area around Rome, which is studded with ancient hilltop towns: one catches the light in the middle left distance of this work. Sunset filters through trees with slender branches and delicate, trembling leaves. De Heusch is particularly poetic in his depiction of trees, which set the tone for the whole landscape with their gracefully entwined branches. By partly obscuring the distant hills, they provoke a desire to journey onwards into the distance. The central motif, with two young trees growing in harmony, the trunks echoing each other, can also be found in de Heusch’s Italian landscape with herdsmen in the Rijksmuseum, Amsterdam. To the left, a flock of birds soars as the apricot light melts into the deepening blue. In the shadowed foreground, a shepherd herds a small flock of sheep and a donkey homewards along a rocky track. Unlike Claude Lorrain (c.1604-1682), who lived in Italy from the 1620s, Both and de Heusch rarely introduced Biblical or mythological scenes into their Italianate landscapes, preferring to depict the peaceful, timeless life of the peasants in a way little changed since the days of Classical Arcadia. Indeed, the long-legged, lean sheep roam the hillsides of the Campagna still. Willem de Heusch was born in Utrecht in 1625, the son of the postmaster Hendrick de Heusch and Jenneke Tentenier, who was from Cologne. He was a pupil of Jan Both, whose Italianate landscapes he emulated. De Heusch went to Italy circa 1640-45 and subsequently signed his works G (for Guglielmo) de Heusch. (This signature is sometimes confused with his nephew and pupil Jacob de Heusch (1656-1701) who also went to Italy and Italianized his name to Giacomo). Willem de Heusch returned home via Lyon and was back in Utrecht by 1649, when he was Dean of the Guild of St Luke; Jan Both and Cornelis Poelenburg were on the council in that year. De Heusch specialized in Italianate landscapes, with delicate, rippling foliage and the evocation of a sunny, Arcadian world. As well as paintings in oil on panel and copper, he made a number of etchings of Italianate landscape, a few with mythological themes, such as Landscape with Pan and Syrinx (Rijksmuseum, Amsterdam). He sometimes collaborated with Poelenburg and Johannes Lingelbach, who provided the figures in his paintings. Heusch died in Utrecht in 1692. The work of Willem de Heusch is represented in the Rijksmuseum, Amsterdam; the Centraal Museum, Utrecht; the Mauritshuis, The Hague; the Louvre, Paris; the National Museum, Copenhagen; the Kunsthistorisches Museum, Vienna; the Museum of Fine Arts, Boston and Worcester Art Museum, MA. Oil on copper 8 ½ x 11 ½ in / 22 x 29 cm; inv. no.SK-A-150.